Figure below shows the circuit diagram of the PMOS load inverter. 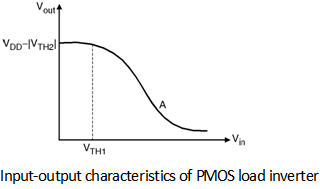 Figure below shows the input output characteristics of the PMOS load inverter. The output voltage equals VDD - VTH2 if V in < VTH1. For Vin > VTH1 Vout follower an approximately straight line. As Vin exceeds Vout + V TH1 i.e. beyond point A M1 enters in the triode region and the characteristics becomes non linear.